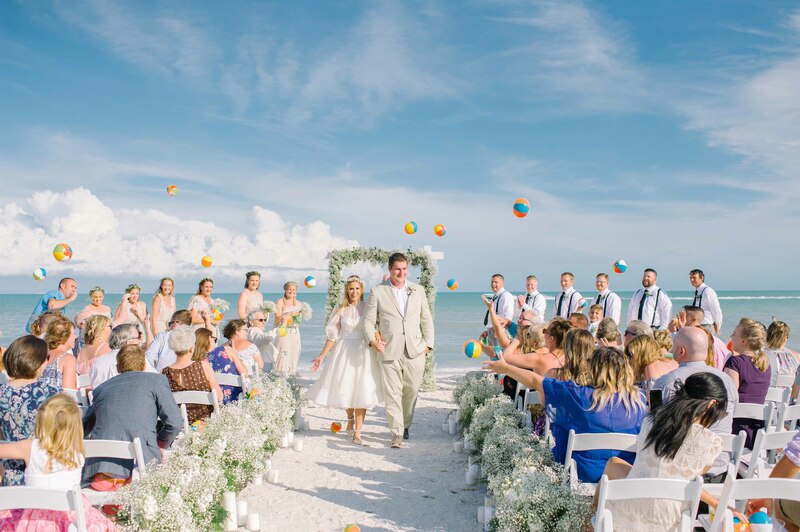 It was our honor to host Jamie and Tim last month as they tied the knot on our beach. We wish them many happy years together and hope you enjoy getting to know them as much as we did. All photos provided by Lanaponomarenko.com. Tim and I met at a four-day country music festival called Country Thunder! It’s located in Twin Lakes, WI. I went with a small group of my friends, and Tim went with his family. There are campgrounds set up for those concert-goers who choose to battle the July heat and camp overnight for the concerts. Tim and I just so happened to be camper neighbors! We spent most of the long weekend hanging out, and one night Tim asked me to go on a helicopter ride the concert had set up. That ride and weekend started a friendship that turned into a relationship that eventually brought us to Sanibel to get hitched! I grew up in a small town near South Bend, IN. My parents and I loved going to Notre Dame for sporting events, walking around the campus, attending Christmas Eve mass in the Basilica, and praying at the Grotto. I had planned a girls’ weekend with my best friend Kaitlin, who was my maid of honor and a professional photographer. During my stay, she had a family portrait to shoot on campus. Kaitlin told me to get dressed up and we planned on going to a nice restaurant after her shoot. When she was done, she suggested I go down to the Grotto and she would take an “OOTD” (outfit of the day) of me. I thought this was kind of weird since the Grotto is a very calm, peaceful place for prayer. But she insisted, and I didn’t question her. As I was posing, I saw Tim out of the corner of my eye, who was supposed to be at our house on the outskirts of Chicago. He walked over to me, got on one knee and proposed. It was awesome, and thankfully Kaitlin was able to capture everything, including my “OOTD”! I would call it 1970’s “boho chic” and casual. Tim is pretty laid back, as are our friends and family. We wanted everyone to feel comfortable and at ease during our beach ceremony. However, I am also obsessed with vintage pictures of weddings from the 1960’s and 70’s. I knew I wanted greenery and baby’s breath everywhere and worked with my florist to create a simple but elegant aesthetic with pops of gold. My favorite detail was the centerpieces – I scoured antique shops for vintage wedding cake toppers and home goods stores for cake stands and glass domes to display the cute miniature couples. It was a project for sure, but very personal and memorable to me. What was the inspiration behind your dress? 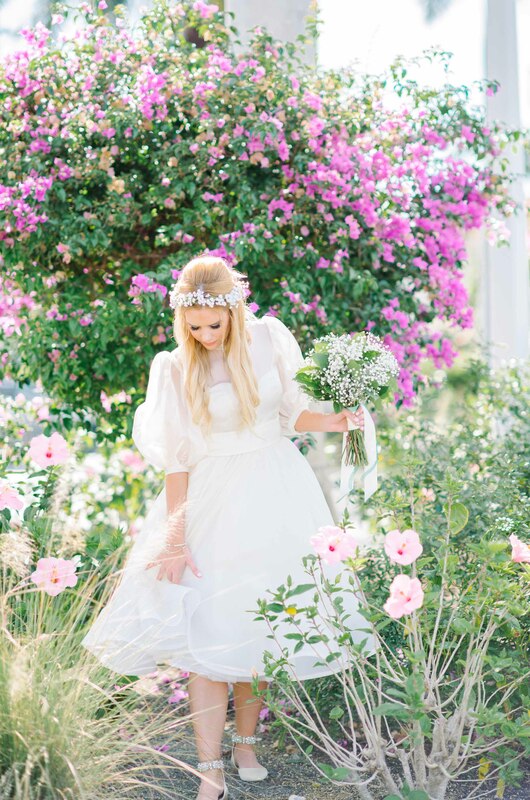 Behind your bridal party’s attire? My dress was inspired by Audrey Hepburn. I didn’t know much about what I wanted for my wedding growing up but, from the moment I saw Audrey Hepburn’s tea-length dress, fitted and flared at the waist, with sheer sleeve details, I knew I wanted to replicate the look. My dress was an exact replica of her (first) wedding dress, made for me by a seamstress in Singapore. I couldn’t believe she made my dream dress, and that I found her on Etsy! The bridal party’s look was inspired by my love of vintage and our desire for our wedding party to be comfortable in the Florida heat. One of my aunts had her bridesmaids wearing floral printed dresses from the 1970’s and I always thought that was cool, so I went with floral printed maxi dresses and each bridesmaid got to choose the cut and style of the dress. The hair stylist did an amazing job accomplishing the “beach boho” look I was going for, which incorporated a lot of braids and baby’s breath crowns. The groomsmen wore lightweight white shirts, grey pants, a black tie, and suspenders. Their look was definitely inspired by a beach look we found on Pinterest. 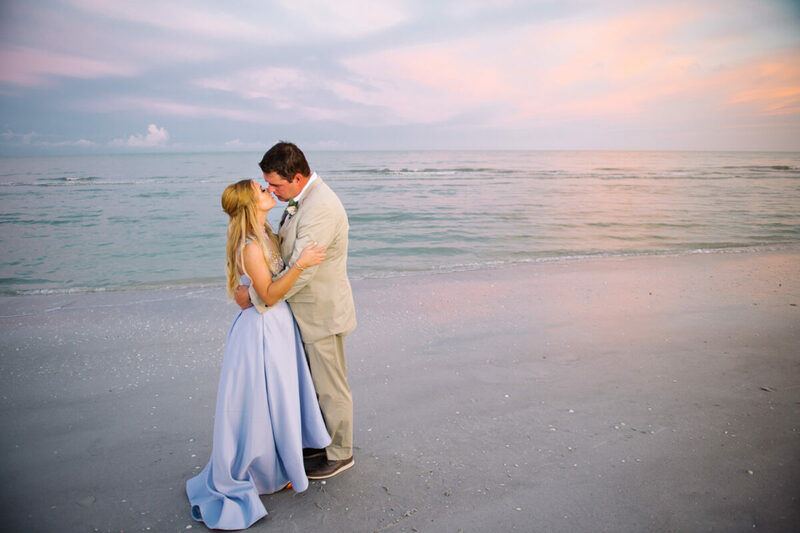 Why did you decide to have the wedding at Sundial Beach Resort and Spa? Tim and I knew we wanted to have a destination wedding to start the summer early for ourselves and our guests who have to battle the Chicago winters. We took a weekend to visit five different potential venues on the island and Fort Myers Beach. From the moment we walked onto the Sundial Resort property, we knew the venue was different. We met with a wedding coordinator, toured the property, and looked at both the inside and outside venue options. Seeing how happy the people at the resort looked immediately grabbed our interest. We also heard the food had received rave reviews, and our research online sealed the deal – we knew our friends and family would feel just as comfortable as we did during the tour! After we left, we continued communicating via email with Ashley, the same coordinator who showed us around during our visit. She answered our questions quickly, worked with our budget, and provided vendors that helped us immensely since we are not from the area. What are some of your most memorable moments during the wedding? All our time in the hotel room. We splurged on the room we stayed in by choosing an ocean view room with two bedrooms. The first night there, we put together all the swag bags and favors for our hotel guests and wedding. This room became a meeting place, a hangout with friends and family, and an overall great spot for eating breakfast on the lanai. I also loved the rehearsal dinner on the Lace Murex Lawn. The set up was just as I had envisioned. That night was perfect, and we got to spend time with the whole bridal party. The day of the wedding was one big memorable moment. All the bridesmaids got ready in the room with me, and we had some of my favorite pictures taken there. My hairstylist from Illinois traveled to do hair for myself, the bridesmaids, and flower girls. This was a memorable morning getting ready and sharing that time with everyone. The weather was unbelievable and I loved every minute on the beach. I’ll never forget walking down the aisle and taking the time to enjoy the setup and see all the details come together. Finally, saying “I do!” and kissing the love of my life before walking back down the aisle as husband and wife! What are you looking forward to most about marriage? Tim and I both have a lot of goals and dreams for our future and I’m looking forward to seeing how our career paths may change. I’m also looking forward to seeing how our family evolves and grows and hopefully settles down in a house in our favorite town, Wauconda, IL. I love taking the time now to slow down and enjoy our time as husband and wife, and it’s great knowing we have the rest of our lives to come back to a beautiful destination for the many anniversaries to come!